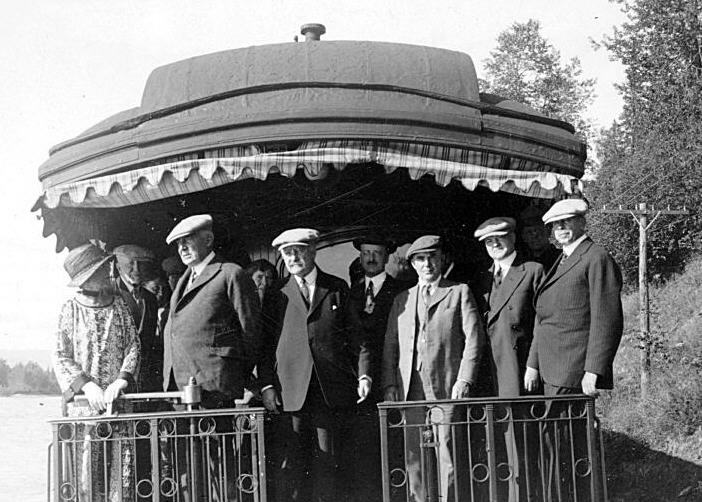 In 1923, Warren G. Harding became the first president to visit the Alaska Territory. Harding traveled by rail across the continental United States, then by ship to Seward, Alaska. The entourage traveled by rail once again to, what was then known as McKinley Park (Denali), followed by the short run north to Fairbanks. At the time, it was one of the longest trips ever taken by a sitting U.S. president. 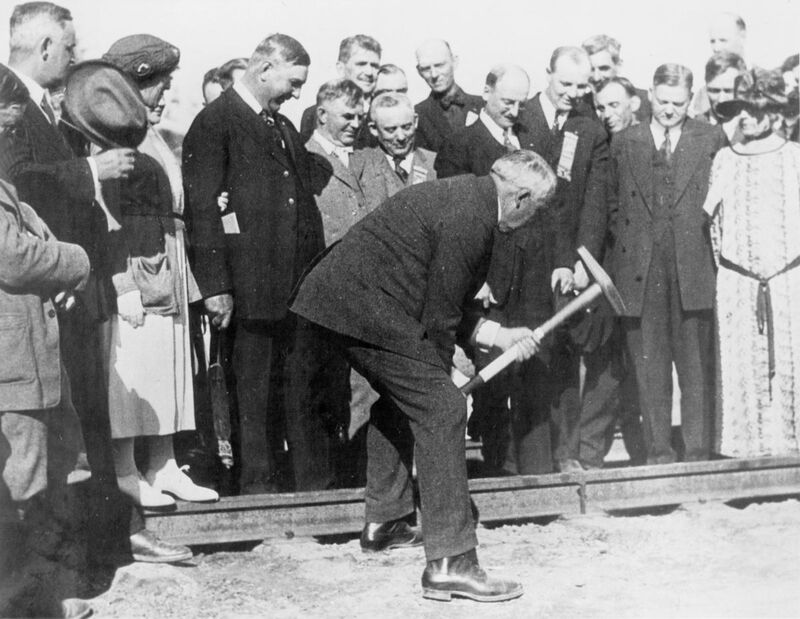 President Harding driving the golden spike in Nenana. Commerce Secretary Herbert Hoover is one of the onlookers. While in Alaska, Harding helped celebrate the completion of the Alaska Railroad, which runs between Seward and Fairbanks. Harding even drove in the “golden spike” at the stop in Nenana. Upon arrival in Fairbanks, city dignitaries were told that no Ford vehicles could be used in the motorcade. Speculation ran wild, but most likely it was due to rumors that Henry Ford may mount a presidential run himself. President Harding gave a speech to 1500 Fairbanks residents in 94 degree heat. A reporter, Charlie Ross, who later served as press secretary to Harry Truman, cursed the White House staffers who advised the press to bring only warm clothing and long underwear. * It was Alaska, after all. Harding and Company were originally scheduled to take the Richardson Trail back to Chitina, and then the Copper River & Northwestern (CR&NW) Railroad over to Cordova on Alaska’s southern coast. Now that would have been a trip to write home about! The Richardson at the time, was an unruly, rugged, mosquito infested track by all accounts, and the railway was affectionately known as “The Can’t Run & Never Will”. Sadly for history and adventure lovers everywhere, Harding’s “fatigue” forced the group to travel back to Seward they way they had come. 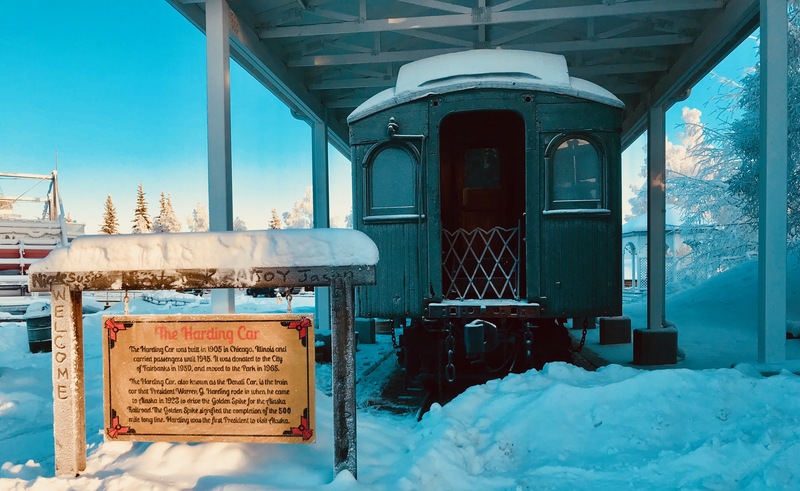 One railcar from President Harding’s 1923 visit is located within Fairbanks’ Pioneer Park. It is a Pullman passenger car, and one of three that was in the presidential train. 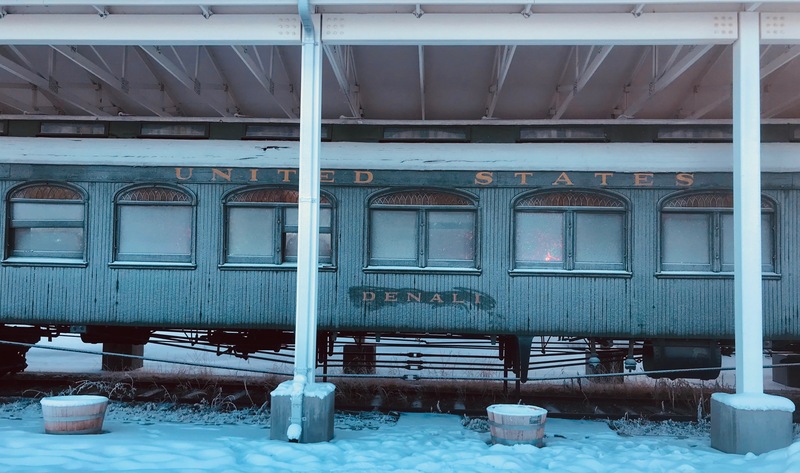 Built in 1905 in Chicago, the Pullman is also known as the Denali car, and carries the Alaska Railroad equipment number X-336. Purchased by the Alaska Railroad in 1923, it saw passenger service until 1945. It was restored in 1960 and given to the city of Fairbanks. It has been in Alaskaland/Pioneer Park since 1967.